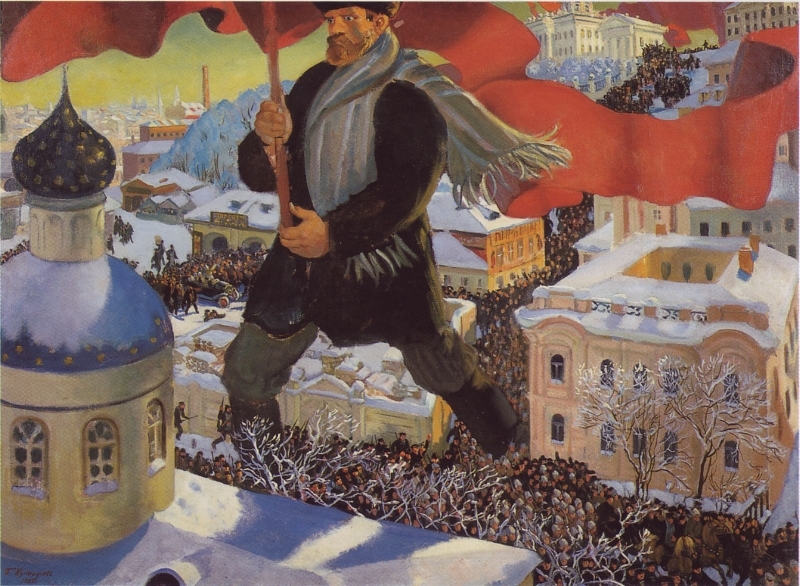 November 7th marked the hundredth anniversary of the Bolshevik Revolution, the more memorable of the pair of uprisings known collectively as the Russian Revolution. Just seven months after Romanov tsar, Nicholas II, was forced to abdicate as a result of the February Revolution, Vladimir Lenin’s marginal socialist Bolshevik party overthrew the Provisional Government in a bloodless coup. The seventy-four years of Soviet rule that followed – responsible for the deaths of millions of Russian citizens - go a long way to explaining the controversy that surrounded this year’s centenary. Whilst much of Europe reflected on the events of 1917 with apparent nostalgia, official commemorations in Russia were notably sparse. The day marking Lenin’s triumph over the Provisional Government has not been a national holiday since 2004 – when Vladimir Putin wiped it from the Russian calendar – yet this month the veracity of the President’s motives came under fire. Given the unprecedented suffering caused under both Lenin, and later Stalin’s, communist regimes, what do Russians today believe is the most appropriate way to commemorate the Russian Revolution of 1917? For an analysis of this topic we use the Socratic method – a form of argumentative dialogue developed in the 5th century BCE, which is a perfect example of critical thinking – to consider issues from the viewpoints of various interested parties. What can we learn from applying the Socratic method to the debate surrounding the appropriate Russian response to this year’s centenary? First, let us consider the timeline of 1917 and identify the key players. NB. This is by no means an exhaustive list and these groupings are of course simplifications with many variations within them. · The Kremlin was reluctant to commemorate the birth of a regime it attributes primarily with loss of life on an unprecedented scale. · In addition, they did not wish to promote revolution as a desirable model for social change. · They believe that commemorations of 1917 should be limited to learning from past mistakes. Questioner: ‘Is that why Mr Navalny and his supporters accompanied their anniversary march through St Petersburg last month with chants of ‘Down with the Tsar!’? The opposition: ‘Yes, exactly. We wanted to take the opportunity to point out the glaring similarities between the Tsarist autocracy that was brought to its knees in February 1917, and Mr Putin’s own administration. While many Russians are rightly reluctant to celebrate the start of what was for many a time of needless tragedy, it is important that we use this occasion to re-evaluate the alarming direction our country is moving in today. Questioner: ‘I’ve been following Project 1917 for the last few months. Was there really the demand for this venture given the reticence of a large proportion of the Russian population to relive the events of the past century? · The opposition under Mr Navalny believe commemorating the 1917 Revolution is key to highlighting the increasingly autocratic regime they detect in Russia today. · Project 1917 is one way in which opposition voices have sought to move the dialogue in the political sphere onto a more widely relatable level. CPRF: ‘To the contrary, I think the number of young people at the memorial march shows that the Communist Party is very much alive in Russia today. The 1917 Revolution was about securing equal human and labour rights for all – that is a message that has universal appeal. Although the political context is different now from what it was one hundred a years ago, it is vital we use this occasion to fight against the state corruption and stark inequality that are all too apparent in our country. Questioner: ‘Your party has not, on the whole, been particularly critical of Mr Putin. Given this how can you justify his administration’s decision to downplay the significance of this year’s anniversary? · Celebrating the events of 1917 remains central to the philosophy of the CPRF who believe similar concerns still exist in Russia today. · They also see commemoration as a means for demanding political reform. Use the comments section below to let us know what you think about this debate. Catherine Lillycrop is a History graduate currently in the second year of a law conversion course. Her particular areas of historical interest are twentieth-century Europe, and immigration in the United States. In her free time, she enjoys cooking and foreign travel. [i] https://www.washingtonpost.com/world/europe/russia-carefully-marks-100th-anniversary-of-great-october-revolution/2017/11/06/94afde02-c284-11e7-9922-4151f5ca6168_story.html?utm_term=.335b29625560, accessed 21 November 2017. [ii] https://www.theguardian.com/world/2016/dec/17/russia-1917-revolutions-legacy-lenin-putin, accessed 22 November 2017. [iii] See ‘The JACOBIN Russian Revolution 1917 Commemoration Project’, https://www.marxists.org/history/ussr/events/revolution/100th/english.htm, accessed 23 November 2017. Newer PostFeatured Book: Elizabeth Anscombe's "Modern Moral Philosophy"
Older PostCatalan Independence: How did it come to this?